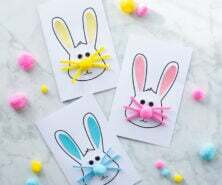 We’re always looking for fun craft activities to do. We like making potato stamps and also love using celery stalks to make flowers. Kids love painting with different materials and this celery craft is no exception! Using the bottom of a celery stalk actually makes the most beautiful rose flower impression. 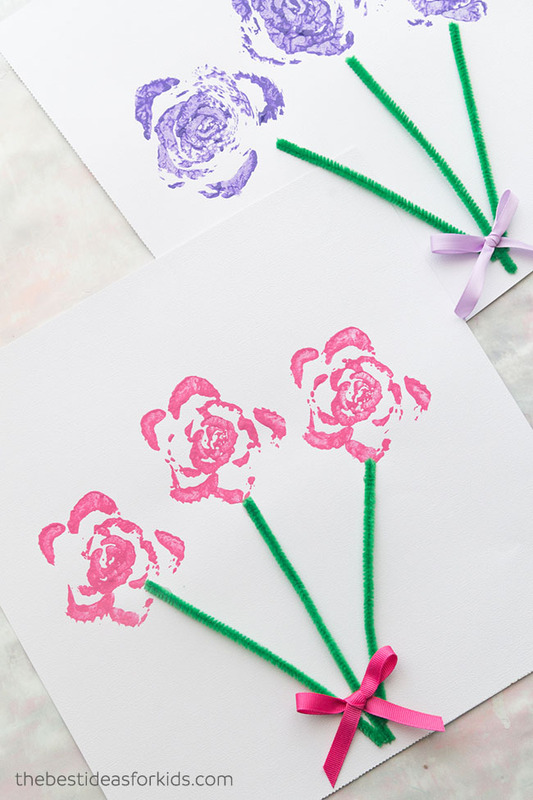 Kids will love dipping these into paint to create their own celery stamped flowers! The best part about this craft is that you usually throw away the bottom of the celery. 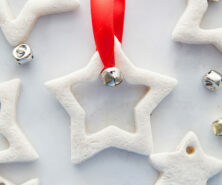 Instead, now you can save them for this easy activity that kids will love! Celery stalks usually will keep in the fridge for quite some time. 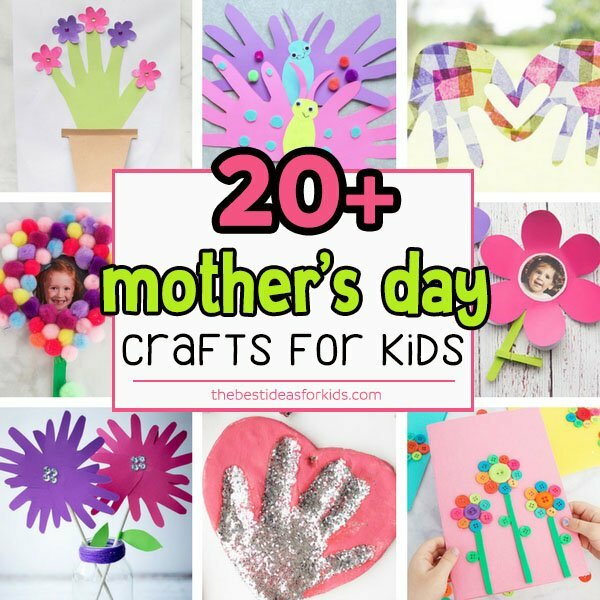 So start saving those celery bottoms for this great Mother’s Day or Valentine’s Day craft. This craft also brings back memories for us. 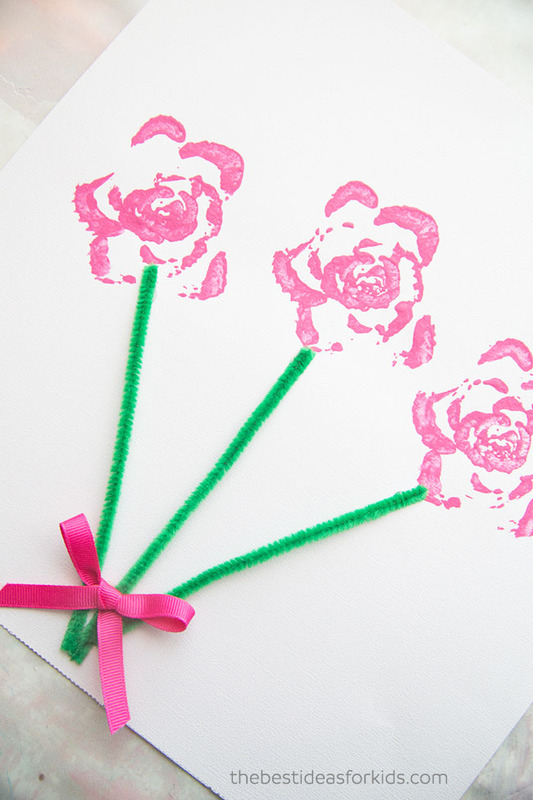 We remember doing these celery roses as kids. Mostly stamping on a paper and drawing stems and leaves with paint. 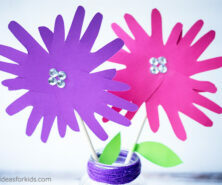 You can skip the pipe cleaners too and let your kid’s creativity take over and make the flowers however they’d like! 1. First cut the bottoms off of the celery. You’ll want to leave a little extra than you normally would so that it leaves enough of the stalks to form the flower. Tip: Try to cut as straight as you can. If you cut diagonally, the celery won’t be even when you are pressing down on the paper and the flower may not show up as easily. 2. Dip into your paint and cover the celery completely. We did try to paint the celery instead and we found that dipping into the paint was much easier. 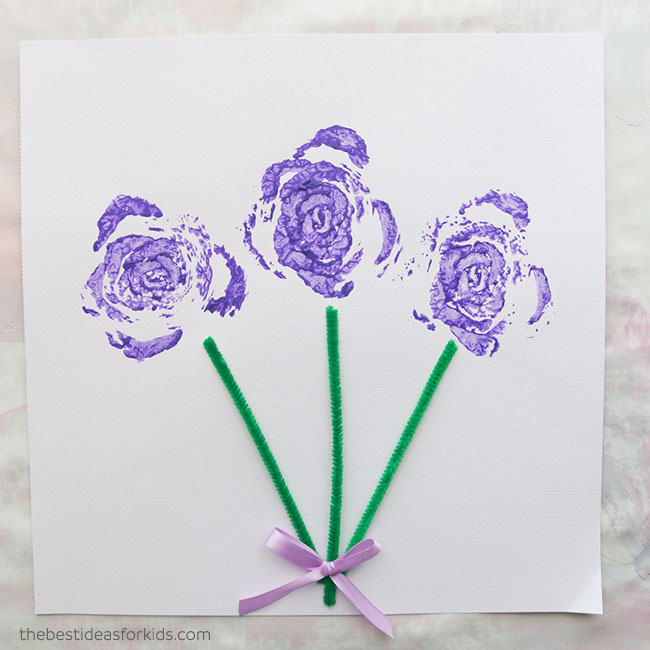 Tip: Have an extra piece of paper to stamp off some of the extra paint before stamping onto your art paper. 3. Stamp 3 roses beside each other. You may need to press firmly. If your full rose does not appear you may need to roll the celery stamp a bit to touch all parts of the celery on the paper. 4. 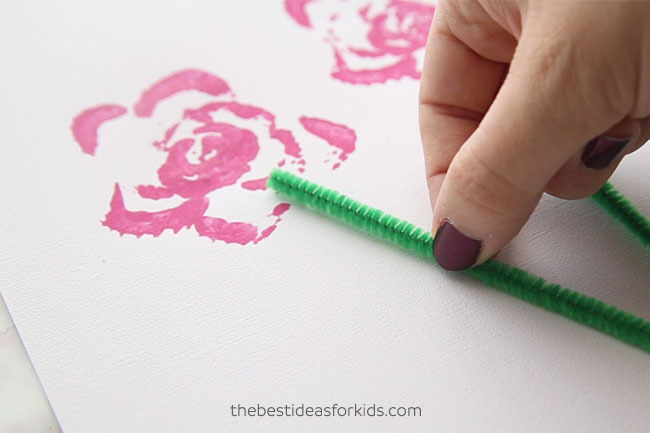 Then take your green pipe cleaners and measure them for size on your paper. You may need to trim a little bit off before gluing down. 5. Glue your pipe cleaners down. We like to use this extra-strong non-toxic brand of glue for gluing pipe cleaners which can be tricky to stay in place with regular glue. 6. Make a bow and glue it on top of your flower stems. And you’re done! 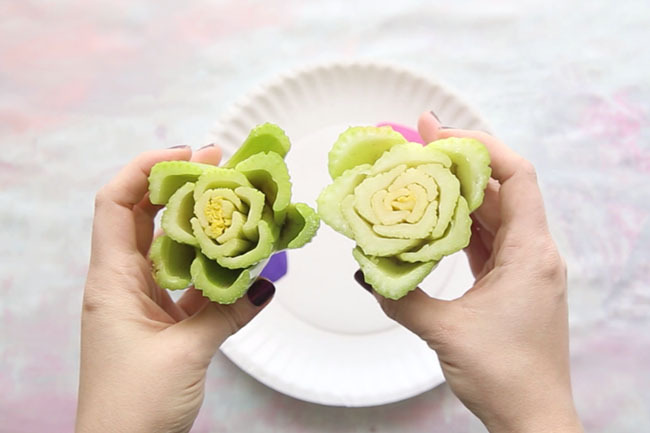 We love how many different ways you can create flowers with celery. We hope you have fun! 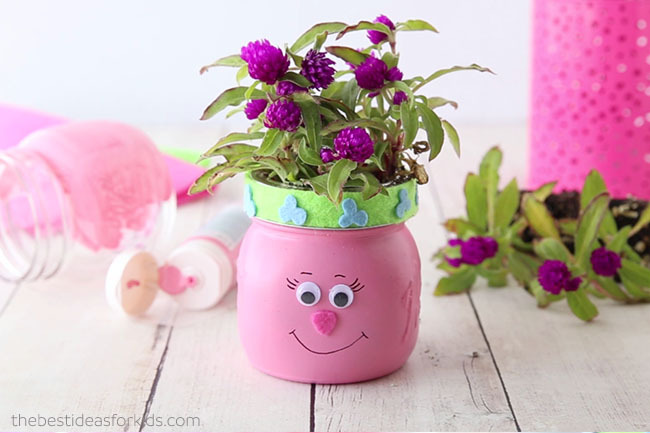 These Trolls Jars are perfect to make for Mother’s Day or for the Trolls fan in your house.